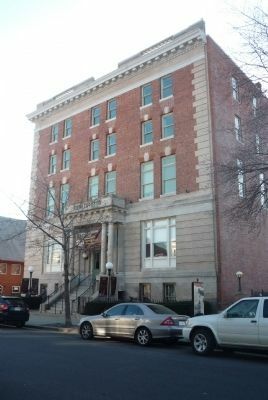 The Thurgood Marshall Center for Service and Heritage occupies the historic Italian Renaissance-style building of the 12th Street YMCA, known after 1972 as the Anthony Bowen YMCA. 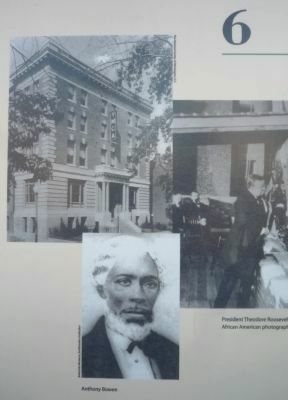 The 12th Street YMCA was the first African American YMCA in the nation, formed in 1853 by Anthony Bowen, a former slave who became a civic leader in the nation’s capital and a member of the city’s Common Council. This YMCA met in various places for decades until it raised $100,000 to build this structure between 1907 and 1912. The architect was Sidney W. Pittman, one of America’s first African American architects, and the son-in-Law of Booker T. Washington. President Theodore Roosevelt laid the cornerstone in 1908. 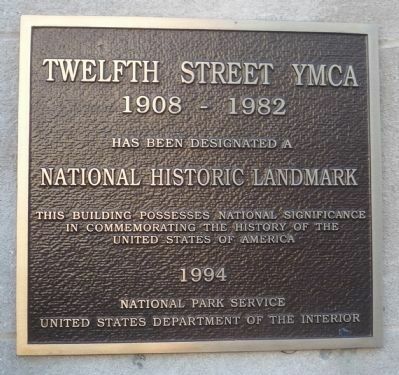 The 12th Street YMCA became a community center for Black Washingtonians from around the city. It was a place to play sports, learn to swim, meet friends, start organizations and mobilize for a cause, including the planning of important civil rights initiatives. For many, including travelers in segregated Washington and Howard University students, the Y dormitories were a home away from home. For youth, it was a place to find role models. Langston Hughes lived here in the early 1920s while he was writing his first poetry. Dr. Charles Drew, who pioneered the preservation of blood plasma, was an active member. 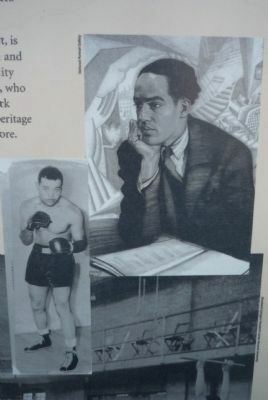 The basketball skills of Coach John Thompson of Georgetown University were discovered here, and world heavyweight champion Joe Louis was a frequent visitor. 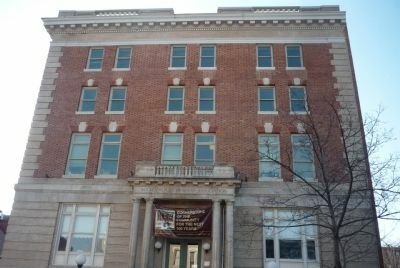 Today, the building, owned by The Thurgood Marshall Center Trust, is the headquarters of the Shaw Heritage Trust, For Love of Children and other organizations that make it, once again, a center of community activity. It is named for Supreme Court Justice Thurgood Marshall, who met here with colleagues to develop legal strategies for the landmark Brown v. Board of Education civil rights case. 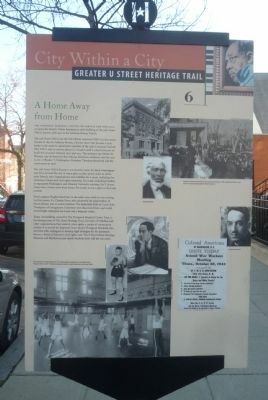 The U Street/Shaw Heritage Museum and Exhibitions just inside the front door will tell you more. The spacious front hall and reception desk of the original 12th Street YMCA, seen here in 1912, have been restored to their former elegance, as have other historic rooms in this fine Italianate building, now the home of the Thurgood Marshall Center for Service and Heritage. Marker series. This marker is included in the Greater U Street Heritage Trail, and the National Historic Landmarks marker series. right when traveling south. Touch for map. Marker is at or near this postal address: 1816 12th Street Northwest, Washington DC 20009, United States of America. Touch for directions. Other nearby markers. At least 8 other markers are within walking distance of this marker. Louise Burrell Miller Residence (within shouting distance of this marker); Frelinghuysen University/Jesse Lawson and Rosetta C. Lawson (about 400 feet away, measured in a direct line); Washington Afro-American Newspaper Office Building (about 400 feet away); Edward “Duke” Ellington Residence (about 500 feet away); The Whitelaw Hotel and “the Duke” (about 500 feet away); Howard University Sets the Standard (about 700 feet away); Marlon Francisco Morales (about 700 feet away); The True Reformer Building (about 700 feet away). Touch for a list and map of all markers in Shaw. Additional keywords. Young Men's Christian Association; William Sidney Pittman, architect. 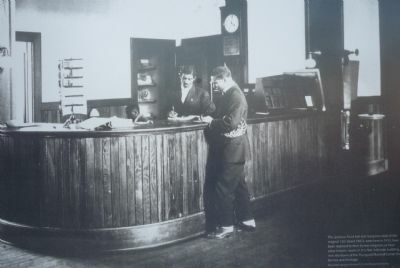 - reception desk, interior of the 12th Street YMCA (1912). - plaque at main entrance. in the former Twelfth Street (Anthony Bowen) YMCA Building. More. Search the internet for A Home Away From Home. Credits. This page was last revised on March 18, 2019. This page originally submitted on March 2, 2011, by Richard E. Miller of Oxon Hill, Maryland. This page has been viewed 983 times since then and 13 times this year. Last updated on March 7, 2019, by Devry Becker Jones of Washington, District of Columbia. Photos: 1, 2, 3, 4, 5, 6, 7. submitted on March 2, 2011, by Richard E. Miller of Oxon Hill, Maryland. • Bill Pfingsten was the editor who published this page.